The Canadian government is a valued partner to The Carter Center, building peaceful relations worldwide and serving as a respected ally in the Center’s steadfast efforts to wage global peace. Since 2006, The Carter Center has proudly partnered with the Canadian government and Global Affairs Canada (GAC) in support of the Center’s work on human rights, democracy, and access to information, with a specific focus on Egypt and Latin America. Most recently, Global Affairs Canada pledged $8.7 million CAD in support of a new project aimed at strengthening women’s voices and leadership in the Democratic Republic of the Congo (DRC). And while the Carter Center’s project focuses specifically on the Congo, it is part of a much larger program led by Global Affairs Canada to respond to the needs of local women’s organizations in developing countries. Comprising over 50 percent of the population, women are the largest disenfranchised group in the DRC. They are consistently and disproportionately affected by poverty and conflict. Discriminatory social beliefs and practices reduce their access to education, information, and opportunities for economic welfare. Thus, women remain underrepresented at all levels of decision-making. Further, laws and practices rarely encourage women’s participation in elections, governing bodies, or the legislative process. But ironically, the majority of Congolese households depend on women’s informal labor to keep them running. Female empowerment is therefore critical to the country’s economic growth and political stability. After over two decades of conflict, the DRC faces significant challenges in realizing gender equality, human rights, and democratic governance. 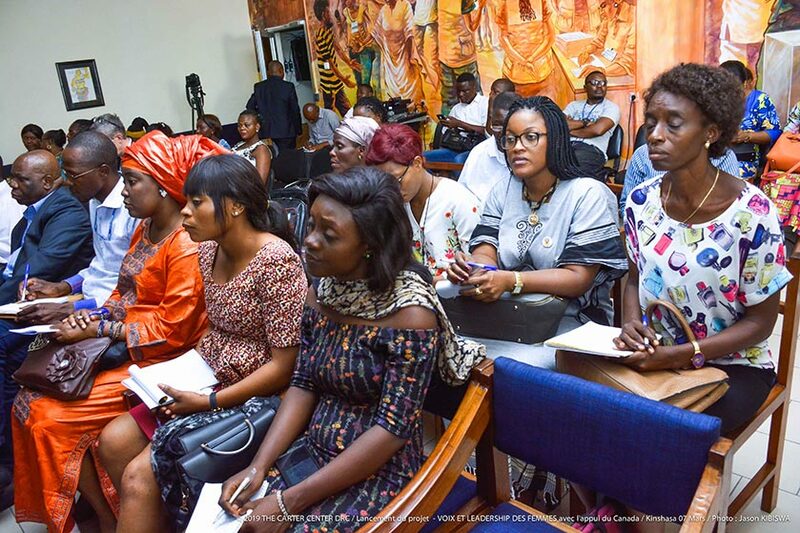 Despite civil society’s commitment to improving the rights of women and girls, many Congolese civil society organizations (CSOs) struggle to effectively advance government accountability, advocate for women’s interests, and drive reform to policy and practice. Additionally, CSOs face challenges in securing and managing funding, further inhibiting their sustainability and ability to effect change. The Women’s Voices and Leadership project in the DRC is a five-year initiative (2019-2023) focused on CSO capacity development and fostering collective action to empower women and girls throughout the Congo. With support from the Canadian Government, The Carter Center will partner with local women’s rights organizations; providing them with the tools, resources, and mentorship they need to strengthen their technical and organizational capacity. Ultimately, with project funding and support, these local partners will carry out projects of their own. The Carter Center’s proven learning-by-doing approach will better equip partner CSOs to influence community discourse and drive change from a local, community-based perspective up through national legislative reform. The Women’s Voices and Leadership – DRC project goals are multifold. The Center hopes to raise awareness of women’s rights and gender inequality issues, promote and protect space for Congolese women’s increased participation, collaborate with local CSOs to implement innovative and sustainable programming, and target key stakeholders to advocate for reforms in policy and practice. Women’s organizations are a key element in the promotion and defense of women's rights and leadership. The fight for global gender equality is essential to the Carter Center’s efforts to wage peace and foster hope worldwide. The Center is grateful for the Government of Canada and Global Affairs Canada’s generous support to bolster our peacebuilding efforts. We thank them for being a dedicated and passionate member of The Carter Center family.